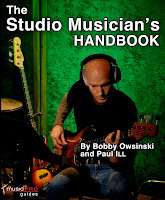 It's a good time for another book excerpt, this time from one that I've neglected on this blog - The Studio Musician's Handbook. 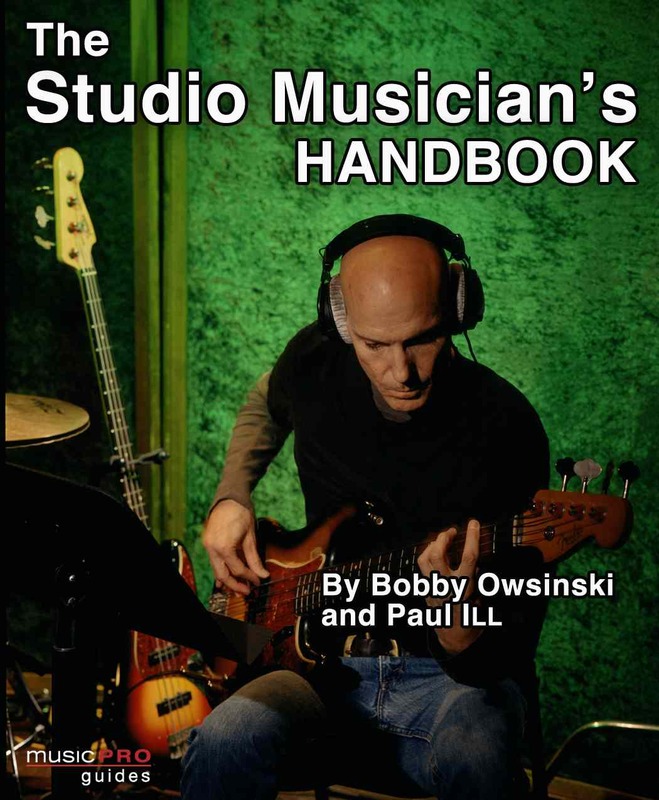 Here's a little from chapter 9, entitled "Session Musician 101." Studio musicians are known for their musicality, which consists of your ears, chops, and feel, as well as your judgment. Session players have enough experience to know what to play and when to play it. They know how to best interact with the artist, other musicians, the engineer, and the producer to make the session the most efficient and fun. They have an innate feel for how to make you and your song sound great. Let’s take a look at some of the musicality attributes that you’ll need. Studio musicians are expected to be creative, extremely versatile, and have a formidable skill set. They’re usually the best players in town. Overall, the session musician is playing to a recording medium where there is little or no entertaining involved. Playing live is all about entertainment and finesse gives way to the crowd and the heat of the moment. The same musician will come from a different place in the studio and will need to utilize finesse and restraint to create a different “feel” than when playing live. And there is a completely different set of challenges on a session. Live music terminates in the air and is a series of “snapshot” moments. Sessions can be seen as opportunities to create musical “building blocks” that terminate on recorded media and are meant to be frozen in time forever. That’s why session musicians fare just as well in the live idiom as everyone else. Sadly, the same cannot be said for the majority of musicians who cull most of their experience playing live. Your ability to read music will determine the type of sessions you can play on. For record dates, the ability to read and transcribe lead sheets is essential, but many other sessions like jingles and television and movie scores require expert sight reading. Musical artists the world over know and love Starr Ackerman, the PR and Artist Relations person for IK Multimedia. How could you not? She's fun, gregarious, accommodating and knowledgeable. But Starr is also an artist and producer in her own right, so she knows of what she speaks by virtue of her own experience. Visit Starr's blog and her YouTube channel for a real treat. My first real job was in radio, but I realized I wanted to make music rather than sell advertising or be on the air... So I went back to school to learn - Full Sail in Orlando Fl. I started out as a music producer/vocalist, and had gone to recording school to learn the art of recording, producing electronic music and mixing sessions (which is SO IMPORTANT if you expect to have real knowledge of the craft). Once that was finished, I worked in studios as an engineer (for Mario Winans, and other heavy hitters), and on the side I was making music and playing electro-house shows with my pal DJ “Rolan Live” Sereny. It was a lot of fun playing the Hard Rock in my hometown of Tampa FL!!! But both jobs are sort of hectic in the “earning money” category, so I always had a side job...and that was at IK Multimedia and Sonic Reality (where I was doing freelance public and artist relations/marketing). Of course, now it is more of a full-time gig, and I still get to make music with the best software and work with some of the best artists for music software promotions. I still have releases on iTunes and Beatport (and like 300 download stores all over the planet for electro house and breaks). I guess that I am a girl and I know how to produce music from start to finish, and use that knowledge to spread the craft to others. I don’t know too many girls who have done a kickass remix on an NIN song, or released their own music (and made the video too...). But I guess if you look at the NIN site, there are probably a LOT Of girls who made NIN remixes...and videos...so who knows. I do have a unique perspective as a female who works both on the business side of things in addition to the stage performance ( I’ve also thrown some pretty large scale concerts and festivals). I also thoroughly enjoy my job(s), so I think that’s why its easy for me to do PR and AR, as I naturally gravitate toward musicians, because we all speak the same language. So yeah, basically nothing...lol. Here is a video I made when I was in Ibiza, Spain last summer for a song I solely produced and wrote, called “Anything”. I guess you could consider the genre- deep house, or electro. OMG... There are too many to count. On the female side? My Mom - she is a natural in PR, and hilarious! Bjork and Jewel, because they made their own music too, and it was really out there but still commercial enough to get notoriety. Males - well of course, the CEO of IK Multimedia, Enrico Iori, is an absolute genius, so its easy to be inspired by his passion for music production software and hardware (pro audio toys!). Same with Gary and Dave Kerzner from IK Multimedia and Sonic Reality. Those two guys could sell ice to an eskimo, and have amazing talent at building unique teams of people that all get along and love each other! Bands? NIN- obviously, U2, Rabbit in the Moon (my friends! ), Jane’s Addiction, The Cure, Massive Attack, Daft Punk, Delirium, Justice, Armin Van Buren....I am sure there are a lot I have forgotten to say- but you get the idea. I love alternative rock, beautiful vocals, French electro, trance and tribal music. I mean, who could not be happy doing that? I could always be marketing toilet paper....talking to people about what is the best way for them to say “I love the way this wipes”, Or “This wipes the best!”. So I am pretty lucky that I get to market the tools that inspire musicians to make music/get Grammys, etc, instead of handing out toilet paper. When I was younger, I was a Smirnoff girl, dressed in a lime green cheerleader outfit handing out free booze...so a lot has changed over the years! Hmmm, I guess that would be in 1 of 3 places, all the time: 1. Sleeping in my bed after a nice night in the club or a concert laughing with my friends. 2. On the beach in the morning before work- either surfing or just swimming in glassy clear water of South FL. 3. In the studio making music. I’m not a huge fan of advice, so I try not to spread those “opinions” too much. But I am a big fan of kindness, and I would have to quote some lyrics from Jewel on this one: “In the end, only kindness matters...”. Here's a great example of how someone with real talent can get warped by the glitz and glamour of Hollywood. Below you'll hear the real vocals of Britney Spears during her tour. You're going to listen and say, "How is it that this girl got so far in the business? ", but I urge you to keep an open mind. After you listen to the atrociousness of the first video, go to the second and have a listen, especially from about 1:00 onward. This girl has some pipes! Or at least had them. It's hard to tell what her current vocal state really is with the so-called songs she now records being so unchallenging. Plus, when your fans care more about how you look and dance than how sound, the Brit has no reason to push herself. I'm not a fan of Britney, especially of her music, and I don't want to be seen as an apologist for her. I don't believe for a single moment that she'll ever produce any kind of music that will last beyond a year, but I do think it's a real shame when someone lets any real talent they have waste away. I'm a big fan of Green Day and especially of Billy Joe Armstrong. He's become such a great singer over the years and I'm always impressed whenever I see him perform. 1) The acoustic guitar track is a little shaky time-wise, especially on the single note turn-arounds. Did it matter in the song? Not a bit. Would a producer be tempted to make the track perfect? Absolutely. Congratulate Rob Cavallo for resisting the temptation. 2) The acoustic track is pretty noisy, which I suspect is self-noise from a condenser microphone or perhaps a tube preamp. Doesn't matter in the grand scheme of things though. 3) The electric guitar track is doubled with the identical sound and panned left and right. Once again, it works great for this song. Many producers would change the sound or the ambience of the double to make it sound different, but not here, which proves the perfect fit. This week we're going to listen to some modern tracks. Not that there's anything wrong with the golden oldies from the 60's, 70's and 80's, but it's nice to contrast those tracks against the modern production techniques of today. 1) Dave Grohl is really a great drummer. So is Taylor Hawkins, the Foo's drummer on everything after this record, but Dave shows you just what he's made of, since this is no easy pattern to play as steadily as he did (especially the kick drum part). I suspect there was at least some cut and pasting done here, since you can hear what seems to be a section dropped in between :27 and :34 and edits at 1:21 and again at 2:39. 2) The vocals are a great example of modern vocal production. They're almost perfect except for the female background being slightly out of time on the first chorus (not that you'd ever hear it when all the instruments are added). In fact, the lead vocal is about as perfect as you can get. There's not an out-of-tune note or a mis-phrase anywhere to be found. 3) The vocal sound is also an excellent example of modern production techniques, with the vocal not relying solely on reverb to give it some space. You hear a fair amount of a modulation (sounds like a Harmonizer detuned slightly up and down - always a great effect but not that new) as well as a subtle delay.